It’s early, but spring has come to west Michigan. Today on a walk to the mailbox I saw some green sprouts popping up along a creek that runs under our driveway. It flows into a pond that still has a little ice on it…but not for long. The tall weeds around the creek are matted down; Jim pointed out that something big made its bed there; maybe the delicious herd of deer we have in our backyard each morning. The corn they leave is quickly devoured by three, fat male turkeys. Last year, I had their girlfriends and babies in the woods next to my bedroom and each morning, they made their way across the yard to the neighbor’s corn field. Lately, the Great Dane who lives on the horse farm across the way has been coming to do his morning toilet on my front lawn. I live in fear that the turkeys are going to return to their old nest to lay their eggs and the Dane will have an early Thanksgiving dinner. I love dogs, but this guy is a bit much. Plus, he’s black and white spotted, like a cow. I thought he was a calf the first time he came over. My mission is to find a loving way to ask his owners to keep him in his own yard. The last resort would be to run fencing across the property. What keeps dogs out might also keep deer, foxes and other four leggeds away. My dear friend Jill had her garden tilled today. My wonderful neighbors, Kirk and Terry, not of Great Dane fame, are thinking about their garden already, too. Last year they supplied us with vegetables all summer. Tomorrow is my dear, late mother’s birthday. She would have been eighty-four. 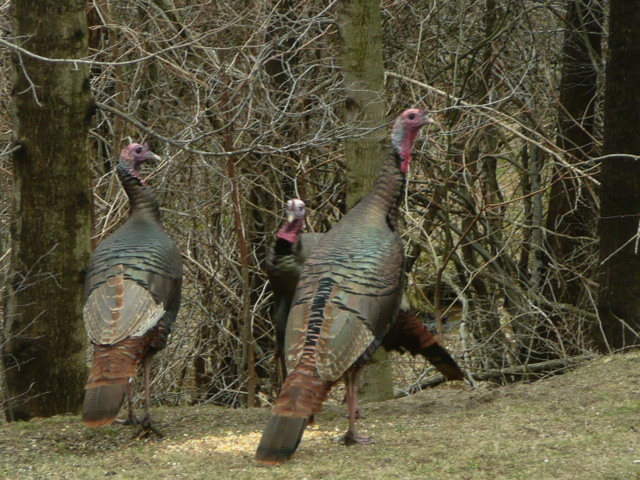 The return of the wild turkey to Michigan was especially exciting for her. Last spring she saw a gaggle or flock, or whatever they are called, near her house and because of the haze of the sun, and her failing eyesight, she said at first glance she thought it was a group of men standing around talking, they were so tall. She would be thrilled to see my pictures of this trio of males. Happy birthday, Mom! I miss you.